In China, the tiger is said to be the king of all land beasts. The Shaolin Monks adopted the spirit of the tiger for its courage, strength and power. Because its energy is external in nature, the energy of the tiger is different from the other animals in the form. The tiger's strength comes from hard-pressing attacks. Developing a strong back and neck is essential for strong stances. The primary technique in the tiger form is the tiger claw, which targets the opponent's face, neck, groin, arms and wrist. 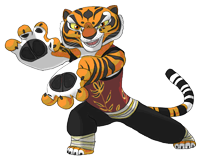 The tiger form also utilizes palm strikes, fists and special kicking techniques, such as the tiger tail kick (fu mei geuk). Proper breathing is important for developing power and force. The practitioner produces certain sounds to expel carbon dioxide and replace it with the oxygen necessary to deliver the proper energy within his strikes.